The family of journalist Mohammed Eshtiwi appealed to human rights groups to pressure the Israeli occupation authorities (IOA) into allowing him to travel abroad for urgent medical treatment. The family said in a press release on Saturday that Eshtiwi has medical reports stating his need for treatment abroad but the IOA would not allow him to travel. It said that the IOA returned Eshtiwi from the Karame crossing leading to Jordan a few days ago at the pretext that he was banned from travel due to “security reasons”. The IOA even refused to grant Eshtiwi permit to receive treatment in Jerusalem or 1948 occupied Palestine hospitals, the family said. 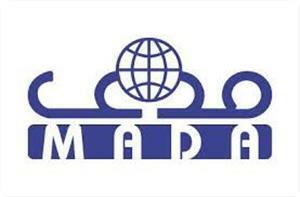 The Palestinian Center for Development and Media Freedoms (MADA) expressed in a press release, its concern about the continued closure of Ma'an agency and Alarabiya TV offices in the Gaza Strip since 25th of last July, and the policy of prosecuting journalists and bloggers, which increased after the dismissal of Egyptian President Mohamed Morsi and after the events at Rabaa Aladawaia and Alnahda. Most recently was the arrest of journalist Thaher Alshamali in Ramallah, and blogger Hazem Salamah who was called for interrogation in Gaza. Mousa Rimawi the General Director of MADA stated that the continued closure of Ma'an and Alarabiya brings us back to the dark era in the first months after the Palestinian internal division in mid-June 2007, which witnessed the closure of media outlets headquarters in the Gaza Strip and the West Bank, the prohibition of media outlets from working, and the prevention from newspapers distribution, in addition to large prosecutions of journalists. He added: "We believed that we have passed that stage, especially after the breakthrough that has occurred in media freedoms status during the past year and a half, but the return of tension to the relationship between Fatah and Hamas and the recent events in Egypt overshadowed darkly on freedom of expression in Palestine, and led to the deterioration of the freedoms of media in the last two months". The Attorney General's adviser in Gaza, Ismail Jabr has issued an order on Thursday 25th July 2013 to close the offices of Ma'an and Alarabiya in the Gaza Strip on a temporary basis under the pretext of (Fabrication of News and spreading fabricated rumors and unreal information that is not based on the source of truth that threatens national peace and harms the Palestinian people and its resistance). Rimawi stated that the continued closure of the offices and prosecution of the journalists is a breach and violation of media freedoms and to the articles 19 and 27 of the Palestinian Basic Law. 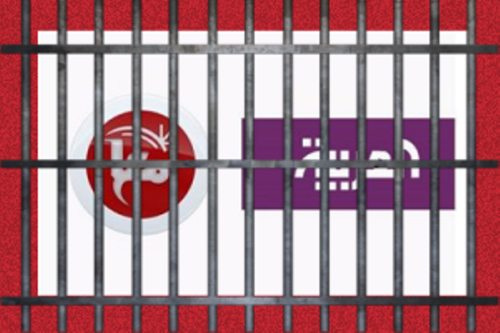 In addition, the decision to close was temporary, but did not specify the duration, which gives the potential for closure to take months or years, so we (MADA) call for the offices to be reopened immediately, to enable the journalists and the media outlets to work freely and safely, to end the prosecution of journalists, whether in Gaza or the West Bank, and allow the re-printing and distribution of newspapers in both Gaza and the West Bank. A Tel Aviv district court has rejected legal claims against Palestinian officials accusing them of incitement against Israel which led to “terrorist” attacks against Israel and Israelis. Judge Dalia Gannot strictly rejected the testimony of the founder and director of Palestinian Media Watch, an Israeli media watchdog group which monitors Palestinian media outlets and publishes reports about incitement against Israel. Marcus was summoned as an expert witness by the complainant, an Israeli family whose son was killed in a shooting about 10 years earlier. But the judge deemed Marcus an “incompetent” witness. The family’s attorney accused senior Palestinian officials including President Mahmoud Abbas of incitement against Israel which encouraged Palestinians to carry out attacks against Israelis, one of which led to the killing of a member of the family. The attorney claimed in his pleading that senior PA officials were indirectly responsible for the killing. Lawyer Joseph Arnone, who represented the PA, argued that the challenge was completely false as the incitement theory was based on quotes taken from unofficial and unpopular news outlets. However, the judge decided that the evidence Marcus gave could not prove his claims about incitement. The judge argued that Marcus quoted newspapers such as al-Hayat al-Jadida, al-Ayyam and al-Quds as well as the Voice of Palestine radio station, but he ignored very popular Palestinian news outlets. When she asked him about al-Fajr newspaper, Marcus said he was not familiar with that paper. The judge also highlighted that a majority of the newspaper quotes were taken from al-Hayat al-Jadida which is among the least popular Palestinian newspapers, while only very few quotes were taken from the most popular newspaper al-Quds. Asked to explain, Marcus said he did not care how popular his sources were as long as these sources represented the PA.
“I don’t care if only 8,000 people read al-Hayat al-Jadida, all I care about is the messages this paper disseminates,” the lawyer quoted him as saying. Marcus agreed with the judge that Wafa news agency was the official agency representing the Palestine Liberation Organization but he did not use quotes from the agency to support his claims. The judge noted that Marcus ignored the more popular Palestinian news outlets, and thus his theory of incitement was unacceptable. She wondered why he did not use any quotes from major Arab channels such as Al Jazeera and Al Arabiyya which are very popular in the Palestinian territories. The judge concluded that the complainant could not prove incitement by PA officials. “If that was true, the PA would have used the most popular news outlets to disseminate its messages to as many Palestinians as possible,” she noted. She noted that there was still “disgusting” incitement in some Palestinian outlets. The judge also pointed out that the complainant presented only 76 news reports and articles documented in 15 years from 1995 to 2010. This is very few, the judge said, given the large number of news reports published in 15 years. She added that many of the reports reflected the writers’ own opinions. “There is no doubt some Palestinian news outlets incite against Israel and the Jews, but it is clear this is not an official policy of the PA,” the judge concluded. 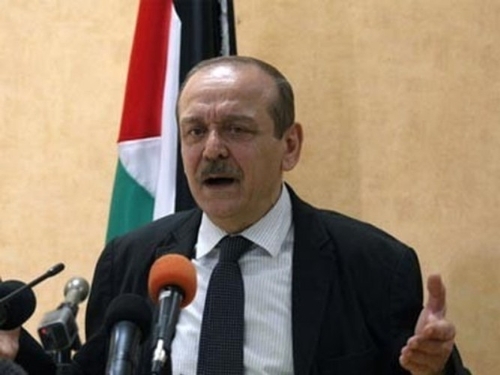 Palestine News Network (PNN) files a written complaint to the administrative council of the Palestinian Journalist's Syndicate against the PLO Secretary-General Yasser Abed Rabbo on Tuesday. The complaint regards Abd Rabbo inappropriate behavior in dealing with a PNN editor, who called him to clarify a statement he made according to Israeli radio, in which Abd Rabbo said that negotiations are not proceeding which may cause catastrophic results. PNN explained in the complaint that the colleague, Mohammed Masalmeh, called Abd Rabbo to confirm the statements and gain aditional information. 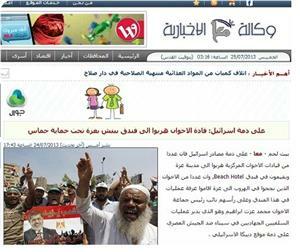 Yet, Abd Rabbo responded by saying that "News and media are ridiculous. Besides, what does clarifying a statement even mean?" He proceeded to hang up the phone and refused to answer from then on. Abd Rabbo could simply have refused to comment or respond to the question in a decent and professional manner. PNN called on the syndicate and media agencies to boycott Abd Rabbo and to take strict measures against him, because it is inappropriate to treat with any journalist or news agency with such disrespect. PNN wonders whether a journalist from an international or Israeli media agency, would have been treated with similar disrespect by Abd Rabbo. PNN demands that the Journalist's Syndicate follows up on the complaint and takes measures against any official that undermines Palestinian media and Palestinian journalists. Palestine News Network (PNN) launched Wednesday, six private community radio networks that aim to support and develop the media, keeping pace with the technological revolution that is taking place in the world. The ceremony took place at the PNN headquarters in Bethlehem and was attended by representatives of the six new radio networks, Iman Jaradat, representative of Community Media Solutions, Daoud Kuttab, General Director of Community Media Network in Jordan, Zuhair Tmaizeh, Director of Public Relations in the Bethlehem Ministry of Information, Hassan Abd Al-Jawwad, member of the Palestinian Journalists Syndicate's Administrative Council and Dany Qumsiyeh, director of PNN’s radio networks. At the beginning of the ceremony, PNN General Manager Monjed Jadou, welcomed the audience and explained the ideas behind and stages of the project, the first of which was the greatly successful Al-Thaheriyeh Radio Network, south of Hebron. Jadou pointed out the importance of these radio networks, noting that the different institutions, including the Journalists Syndicate and the Ministry of Information, support the idea of establishing community radio networks. He stressed that what matters now the transformation of the verbal support into actions implemented on the ground, and the conversion of these community radio networks into FM radio stations. The six new radio networks are specialized to focus on important and marginalized issues such as Palestinian refugees, al-Quds, rural areas, agriculture, and issues around youth and women in the Gaza Strip. Jadou explained that there is an action plan to promote these radio networks and their programs through the PNN website and its partner radio stations. PNN will work to broadcast the community radios’ programs on the eight partner radio stations that currently broadcast PNN programs and news. Hassan Abd Al-Jawwad, member of the Palestinian Journalists Syndicate's Administrative Council, said that this project is an important and creative initiative, stressing that the syndicate will continue to support such initiatives and projects carried out by PNN and other news agencies, because of the positive impact they have on media development in Palestine. Abd Jawwad stated that the syndicate supports Palestinian media that aims to serve and strengthen the society, saying that the involvement of the Gaza Strip within the six new radio networks is proof that the media can continue to unite the Palestinian society. Zuhair Tmaizeh, Director of Public Relations and the Information Ministry, said the ministry was and continues to be one of the largest supporters and facilitators of the various media projects. He said the idea of community radio networks is new for the Palestinian society, and it deserves respect and appreciation because it serves the local communities and particularly the marginalized communities that are often neglected. Tmaizeh added that the Ministry of Information has been an important factor in developing Palestinian media and ensuring freedom of the press in Palestine. The Ministry of Information does not practice any supervisory role, but it supports and cooperates to overcome any obstacles that may confront the media institutions, Tmaizeh added. Tmaizeh expressed his hope for the success of the project, referring to the importance of having colleagues from the Gaza Strip participating in the ceremony and the project via Skype. He felt their participation and cooperation sends the message that Palestine is united, despite the political and physical division. Tmaizeh acknowledged the Palestinian media in the Gaza Strip who operate in extremely difficult conditions. Daoud Kuttab, Director General of Community Media Network in Jordan and Community Media Solutions, said that establishing six community radio networks in Palestine is an important achievement. Kuttab said that the idea of the community radio networks has been implemented in different countries, but it's new to the Arab states. The first project was Aswatuna (Our Voices), which was implemented in seven countries, with PNN was its Palestinian partner, along with Jordan, Tunisia, Yemen, Syria, Libya and Egypt through al-Thaheriyeh radio network. He said it was one of the most successful media projects in the Arab world. He added, the Community Media Network, in cooperation with the Community Media Solutions through the "Our Voices" project that includes community radio networks in seven Arabic countries; including Palestine, seek to develop and expand the concept and idea of the community media. Kuttab called on the networks to focus on locally important issues and not to compete with the national, Arabic and international media concerning world issues, because the community radio networks are specialized to address the issues of the locals. Iman Jaradat, Manager of the Community Media Solutions and Project coordinator of the Community Radio Networks in the Arab world, who came from Jordan to attend the ceremony, said that her institution supports the project for the second year in a row. Jaradat also said that her institution’s backing of the project has two goals: first, to support civil society organizations, media activists and independent journalists for the establishment of media organizations that serve their communities. The second goal, according to Jaradat, is to effect the legislative, legal, community and economic environment to help these institutions become sustainable. Jaradat expressed her pleasure that this project is in Palestine and that the Palestinians support it. The Network aims to improve the local media in terms of form and content and plays a major role in developing the capacities of youth and addressing important and marginalized social issues and also shed light on the role of media in developing the society, she added. Jaradat continued saying the community radio networks strengthen an already positive trend in the local media and play a great role in raising overall production quality. The community radio networks also shed light on the revival of the Palestinian heritage and create connections between the job seekers, graduate trainers and those interested in Media field and the local media institutions to provide jobs and training opportunities. Jaradat stressed that Community Media Solutions is working on finding funding for these initiatives as well as opening new opportunities to any new and unique initiative for the media through Community Radio Networks. Jaradat thanked PNN, noting that their cooperation with the network has proven its determination and keenness in seeking the development of media services in Palestine, and praised the efforts of all the institutions that sought and still seeking to use the community media to express and reflect the society's issues and concerns. 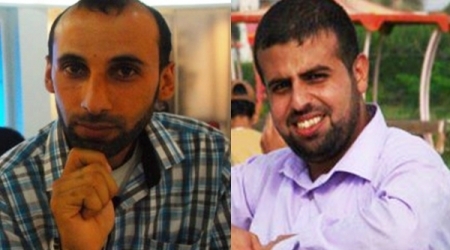 The two journalists Hassan Dohan and Islam al-Burbar from the Gaza Strip participated in the ceremony through Skype. They said that for months they have bee working on implementing the Community Radio Networks project with the cooperation of PNN and Community Media Solutions. They said that the radio networks are in the center of the Gaza Strip and that they are covering political, local and social news, with a special focus on addressing women and youth issues in the Gaza Strip. 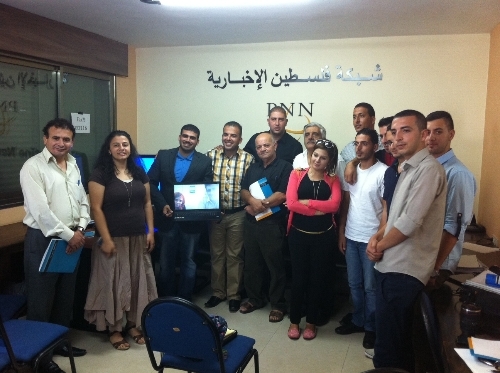 The two journalists thanked PNN and the Community Media Solutions for involving radio networks in Gaza in the project. At the end of the ceremony, a contract was signed between the representatives of the six community radio networks and PNN project manager Bishara Kuttab. As the implementation of the project will start in few days and will be published through PNN. It's worth mentioning that PNN has signed a contract with the Community Media Solutions last year and has close ties with the Community Media Network in Jordan. PNN is a news network that publishes in several languages including: English, French, Spanish, German and Russian and has a number of reporters in several provinces. Additionally, the network broadcasting the news throughout eight private radio stations (FM) and has a TV production department; as it produces programs and documentaries. Six new community radio networks are to be added and will be broadcasting through the internet in the West Bank and Gaza Strip. When the Bethlehem-based M'aan News Agency (MNA) was launched in 2005, with generous funding from the Danish, Dutch and UK governments as well as the EU, UNDP, and UNESCO, many Palestinians thought, or more correctly hoped, it would be a qualitative addition to the highly polarized and chronically biased Palestinian media. Some observers thought the European-funded outlet would soon overcome its numerous problems, including a shocking lack of professionalism, under-trained or untrained staff, serious reportorial flaws and the highly anti-Islamic tendentiousness characterizing the agency's general discourse. However, eight years on, it seems that the overall performance of M'aan is exacerbating and regressing, almost from every conceivable perspective. I don't claim to be the ultimate arbiter who determines what is journalistically professional and what is not. However, there is ample evidence indicting MNA for its excessive un-professionalism, biased news writing, and the brazenly scandalous mixing of hard news with personal opinions. One doesn't have to have a Ph.D. in journalism from a prestigious college to detect these flaws. I am not happy about this sorry state of affair afflicting the agency. I don't think anyone is. Deviation-especially willful deviation-from professional standards and ethics is a cardinal sin in journalism. True journalists must always cling to the timeless journalistic maxim: facts are sacred, comments are free. Last week, I sought to alert M'aan to the rampant mixing of hard news with personal views by its reporters. I wrote an Arabic piece to that effect entitled ليست بريئة وعليها الالتزام بأخلاق المهنة معا" " وكالة ( The M'aan News Agency is not innocent and must abide by the ethics of the profession) in the hope that the agency would try to fix the serious flaws. I spoke twice with an official at the agency headquarters in Bethlehem but to no avail. Eventually, M'aan, which promised to publish the article as an opinion piece, reneged on its promise. Ostensibly, the editorial board viewed the piece too damaging to its reputation and image. But the article was published by some Palestinian newspapers and posted on several websites. This writer can actually present hundreds of examples where M'aan reporters mixed their own views with hard news. This is not an exaggeration. The mixing of hard news with personal views actually constitutes a sort of modus operandi at M'aan. M'aan does this every hour, every day, every week and every month, either willfully or out ignorance or simply due to the absence of accountability. 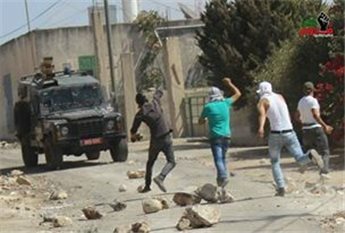 "دعت الجبهة الديمقراطية وحزب الكرامة الناصري إلى عدم الخلط بين شعب فلسطين وقواه الثورية والديمقراطية وبين أية عناصر فلسطينية يمينية دينية طائفية متخلفة وظلامية منخرطة مع الارهابيين لإعادة مصر إلى الوراء عشرات عشرات السنين." The translation: Cairo: M'aan news Agency-" The Democratic Front (for the Liberation of Palestine) and the (Egyptian) Nasserist Karama (Dignity) Party called for making a distinction between the people of Palestine and its revolutionary and democratic forces on the one hand- and on the other hand- any rightist Palestinian elements that are religious, sectarian, primitive and obscurant, which are involved with the terrorists, who want to take Egypt back tens tens of years." Notice the word "tens" was printed twice, which means the report may not have passed through the editorial section or was even seen by the proofreader! Now, is this type of news writing compatible with the professional standards that journalism students learn in journalism schools and universities? The truth of the matter is this type of news writing has more in common with the performance of the Soviet Communist newspaper, Pravda, or worse, the Nazi Party newspaper, Der Strumer. Indeed, if M'aan had had a modicum of professionalism it could have placed the offending epithets such as "rightist, sectarian, primitive, obscurant, terrorists, who want to take Egypt back tens of years" between quotation marks so that the reader would know that the words were contained in the communiqué text, and were not the reporter's. But M'aan did nothing of this sort. Again, this scandalous unprofessional and unethical type of news writing seems to represent the standard, not the exception, at M'aan, which really prompted this writer to write this piece in the first place. I don't know for sure if this conspicuous flaw is the result of ignorance of professional standards, negligence or clumsiness on M'aan's part. It could be a combination of all of these factors. But, whatever the case may be, M'aan is guilty of violating one of the main golden rules of journalism. I personally wish I could give M'aan the benefit of the doubt. I harbor no grudges or ill-will against the news agency. However, the rampancy of this morbid phenomenon, the mixing of views with hard news, leaves no excuses, justifications or extenuating circumstances that may vindicate M'aan. I know that a lot of defensive reflexes or furious "counterattacks" will be unleashed against me. But many college students and young journalists are viewing M'aan as an inspiration and an example to be followed. So, is this the type of journalism ethics that M'aan is trying to inculcate future Palestinian journalists with? A final word to the donors funding M'aan. I don't recommend you sever funding to the news agency. But I do insist you make it abundantly clear to the agency management that your tax-payer money must not be utilized to foster falsehood, promote hatred and racism against important segments of our people, and especially to undermine the cause of honest and professional journalism in Palestine. This writer will continue to monitor M'aan's professional performance until the news agency rectifies its unprofessional discourse. I hope this will happen sooner rather than later. 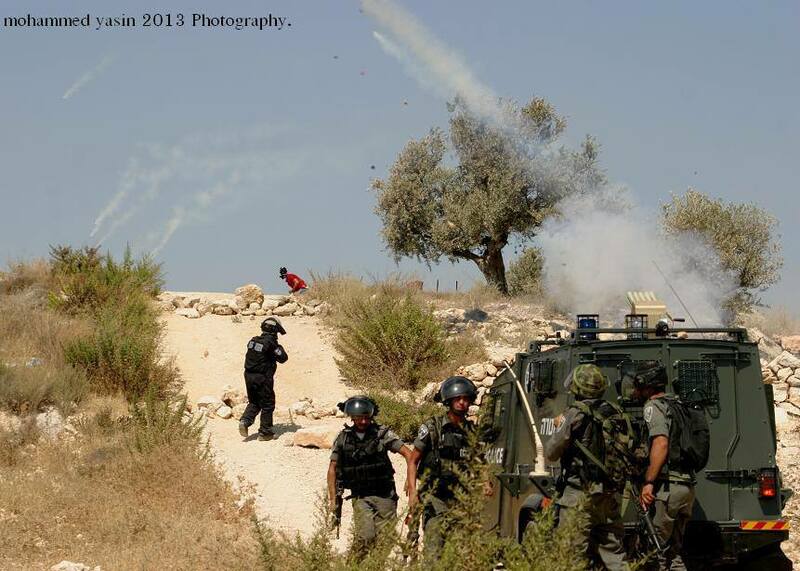 * Khalid Amayreh is an American-educated journalist living in Occupied Palestine.